You’re never too old to dress up and have a laugh. 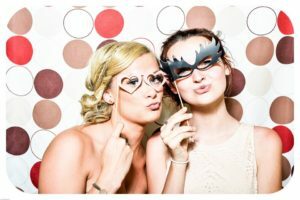 Stick on a big wig, ham it up with a hat or show off with some novelty shades – you can add a bundle of fun to your next event with these fun props for photo booths. In a photo booth, everything is exaggerated for effect. Giant spectacles and colourful wigs can be paired with diva-style feather boas for the ultimate, playful dress-up look. Whatever you go for, make sure the props for photo booths at your event are bright, flashy and larger than life. Show everyone what you’re thinking, in a thought bubble or speech balloon! Personalised messages like this make great props for photo booths, creating comic-style photos that are just a bit different from the usual real-world snap. Chalkboards and hold-up signs are also great ways for guests to get their message across, while giant picture frames offer a whimsical and surreal touch to any photo booth image. 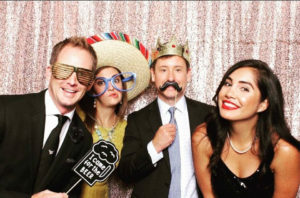 If your event has a theme, the photo booth is a great place to create a suitably co-ordinated souvenir that shows off the fun everybody has had. Summer parties could offer Hawaiian style photo booth props such as grass skirts, flower garlands, ukuleles and cocktails. Props for photo booths at a graduation party could include mortarboards and ‘Class of 2017’ photo frames. Whatever your theme, photo booth props offer a great way to entertain your guests and give them a fun memento, without breaking the bank. Here’s something that will resonate with the smartphone generation – a chance to pose with the emoji of their choice! From smiley faces to piles of poop, a selection of emojis on sticks will allow your guests to show how your party is making them feel. Versatile, light-hearted and instantly understood, the emoji is the perfect addition to any photo booth. Props for photo booths are better fun when more people join in. Include his ‘n’ hers props such as love hearts, personalised signs and double act dress-ups. Then get big groups in on the act with costumes they can all join in with: everyone will love acting out characters from fairy tales and favourite stories or dressing up as their favourite band members from the Spice Girls, Abba or the Village People. Don’t forget to include an assortment of different moustaches, wigs and spectacles for general fun and group hilarity. Many of the best props for photo booths are decidedly lo-fi. If you would like to take things up a level, why not use green screen to create moving backgrounds and custom images? The results will be sensational snaps that transport your guests to another world. Contact Shoot Systems to find out more about our photo booth green screen technology for both photos and videos.